Malton is a nice city. Scenic outcrops of bodies, spanning miles. Majestic hordes of zombies roaming the ravaged and pillaged cityscape. Yep, it's just got to be the place to be, don't ya think? Of course, we may or MAY NOT give you an answer. 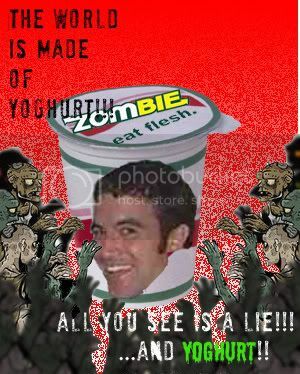 our zombie friends are plotting a global yoghurt conspiracy!. we said "It's a global yoghurt conspiracy!!!" and you were all "whatever" *slurp slurp*. Then the zombies burst in, tearing you limb from limb before devouring you like cheap takeaway. Oh, and I neither confirm nor deny that I had anything to do with that. To get started, click on that dirty gold-ish text showing "Recruitment"
You know, the one under that really cool Airborne dude that's about to blow your brains out. This page was last modified on 20 January 2011, at 22:17. This page has been accessed 39,323 times.